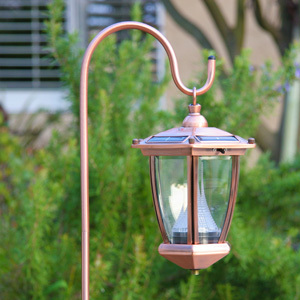 Hanging Solar Lights are a great way to add an elegant touch and strong mood to any landscape. These lights will look great lining your driveway or lining a walkway or pathway though your garden or to your front door. No matter what your budget is, and no matter what your tastes are, you are sure to find a hanging solar light to suit your needs. Unlike traditional lights, these solar lights do not require any electrical wiring, so they are easy to assemble and install, and do not incur the additional costs of wiring, such as the wire, trenching and the costs of landscaping to repair the trenched ground. You will not even have to concern yourself with turning them on or off. Light-sensing technology will automatically turn the light on when it gets dark and off again when the sun rises. These durable lights are durable enough to withstand inclement weather conditions, including hail, wind and even some snow. Hanging solar lights are also very energy efficient. They are able to operate for a full 15 hours on a single, full charge. But perhaps the greatest of all the attributes which these lights possess is the fact that they are both economical and environmentally friendly. Interested in learning more? Check out our Hanging Solar Garden Lights here.